The seat or weight aid is probably the most important natural aid, as it is the aid that is in the most contact with the horse. Unfortunately it is also the most likely to be misunderstood. Before we can do anything in motion we must be able to sit in balance. Becoming aware of how your body is aligned will help you develop the correct muscles and allow you to stay balanced over the horse's center of gravity. My first lesson with every new student begins with the "plumb line" This refers to the alignment of the rider which can be seen from the side. The plumb line checklist is as follows... Ears over shoulders - Shoulders over Hips- Hips over Ankles - with a bend in the knee. Everything drops straight down in a line. If your feet are sticking straight out in front of you, your upper body is going to come back behind the motion of the horse. If your legs are too far behind you, your upper body is going fall forward. When the horse feels this, he will move to correct it. Once we have mastered the plumb line it is time to move on to our seat. Side-to-side balance means that you are sitting with your weight distributed evenly with equal pressure on both seat bones. What if you can't feel your seat bones let alone discern one from the other? 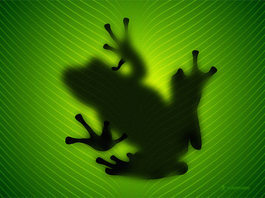 This is where our friend Mr. Frog comes in. Frog Position : Riders draw their knees up to help them find their seat bones and the middle of the saddle and to stay there without gripping with their calves. Initially Many people have trouble finding what is referred to as the "neutral position" which is the equal weight on both seat bones, no weight on your crotch, with your pelvis open, and with your lower back flat. In order to find your seat bones in the saddle grab a hold of your strap or horn and slowly draw the knees upward until you feel both seat bones against the saddle. Once you feel them slowly bring the legs back down trying to keep that feel. Then you may proceed in the warm up: lifting both legs together, then lifting alternating legs side to side at the walk, isolating each seat bone independent of the other (If you are an inexperienced rider do this only while on the lunge line or supervised at the walk.) You may notice your horse begin to slow or attempt to transition from walk to halt as you perform this exercise. This is a normal response as the horse begins to feel the weight of your seat. I am amazed at the number of riders I see who are already a year or two into lessons and have not been taught the value of understanding how to use their weight properly. When you are balanced over the horse’s center of gravity and following its motion, any weight shift creates the feeling in the horse that he needs to re balance himself. Using your weigh distribution as an aid naturally influences the horse to create the shape you desire. Like leg aids, weight aids can be applied bilaterally or unilaterally. For example, to turn the horse to the left, you simply shift more weight on your left seat bone and the horse automatically feels like stepping to the left to keep you centered over his center of gravity. It is important to remember the rider’s upper body position should not change. It is a common flaw for the riders to do too much when attempting weight aids by leaning or collapsing at the hip. Its just a matter of developing the right feel and the right muscles. Balance is something that both horse and rider will revisit many times as they advance in training. 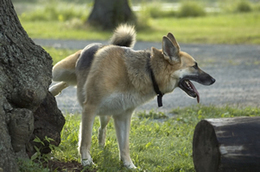 Dog Position: Riders lift their thighs away from the saddle (like a dog lifting its leg) to help them find the center of the saddle without gripping with their thighs. One of my students' least favorite warm up exercises is dog position. A bit crude but the name of exercise is meant to resemble a dog lifting his leg to uhhem... do his business. This uses the abductor muscles to pull the thigh away, stretching your hips and loosening the thigh. Yes it hurts a little... but its a great way to help cure the grippers. Thigh muscle suppleness allows you to wrap your legs around your horse's barrel The adductors are located inside the thigh and they do allow you to squeeze and grip the saddle to stay on in rough situations. 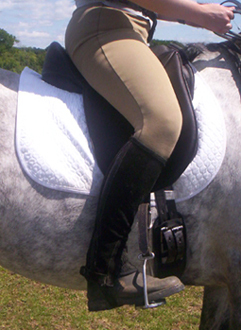 However used in a prolonged contraction, they can immobilize your pelvis and lift you out of the saddle. Tightness in the thigh causes a chain reaction down the leg that also influences the position and effectiveness of both the knee and ankle as well as upper body position effectiveness. This in turn causes more concussion of the seat and upper body making it difficult to stay in the motion of the horse. The abductor muscles (outer thigh) and the adductor muscles (inner thigh) should work together with the hip flexors and be evenly strengthened bearing weight with little force while you are in the saddle. The inner thigh and knee should remain soft and relaxed in every gait. So as it turns running a horse business provides you very little time to devote to much else. When the site began I intended to write more, read more, do more etc. I think life and life with horses in particular have a way of taking all of your extra time and hiding it in a place hard to find... Kinda like the black hole that all the my left socks disappear into... I suppose Everyrider has turned into more of a newsletter than a blog considering I am rarely able to post more than once a week. I don't know how bloggers like Mikael's Mania write (and write well) almost everyday in the midst of running a farm! Although I have only written around 35 articles I have still managed to make so many wonderful new connections in the horse community and found such a wealth of resources online that I never even knew existed. So I thought it might be a good idea to include a few posts that simply review an interesting site or a couple tried and true products. Perhaps I can even throw in a contest or two! Any other ideas are more than welcome! Just drop me a line or leave a comment. I got the website of the week Idea after reading my fellow horse blogger Patricia 's site "The Hinny Whisperer" where she reviews several great horse and hinny related sites, giving you the highlights and reasons why each site is worth the visit. I have tons of great bookmarks and links friends and students have passed along that I thought I might do some passing along myself! 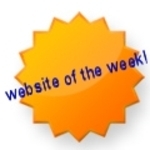 So without any further ado here is our first website of the week! Horsesforlife.com is an amazing online magazine dedicated to preserving and bringing online the wonderful educational resources that should be available to all riders and instructors. While the magazines focus is on Discussing and reporting on topics related to the classical training of dressage horses there are a wide range of fantastic articles for horse enthusiasts of any discipline and breed. 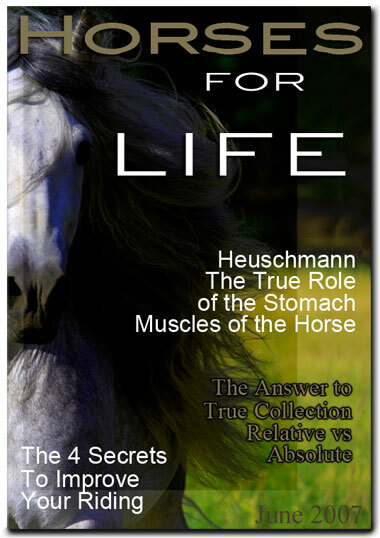 Beautiful images and intriguing video accompany the wealth of in depth articles at horses for life. While there are many free articles to enjoy, I highly recommend purchasing the subscription. I believe it is 14.95 for a three month money back guaranteed trial or $34.95 for the entire year. Once you subscribe you also gain access to the archives of over 175 past articles full of great information. I think I have read them all! The magazine comes out once a month and usually consists of a dozen articles or so. The horse health articles alone were enough to make subscribing worth it to me. There are several health related articles with all the latest veterinarian research and the possible impact on our horses. A few examples of health related topics are listed below. What head position may cause your horse breathing problems? At what age are his bones mature, ready to go to work? What recent research discovered that fusing of the lumbar and thoracic vertebrae may be a concern for the horse that is put into work too early? Can the cavesson be causing your horse pain? There are at least 3 free articles in every issue that you can read without registration so head on over to Horsesforlife.com and take a look ... You won't be dissapointed! The horse industry is changing! This site is for the enthusiast that seeks a better understanding and knowledge of horses and their nature. The topics will vary from training and riding to horse health and care. We aim to serve every rider that shares the desire to progress. Ken Griffey Jr Shoes on Can I Have Your Attention Please? grazing in the meadow of creativity!! UmmYeah.com - Dear Productivity, It was nice knowing you.